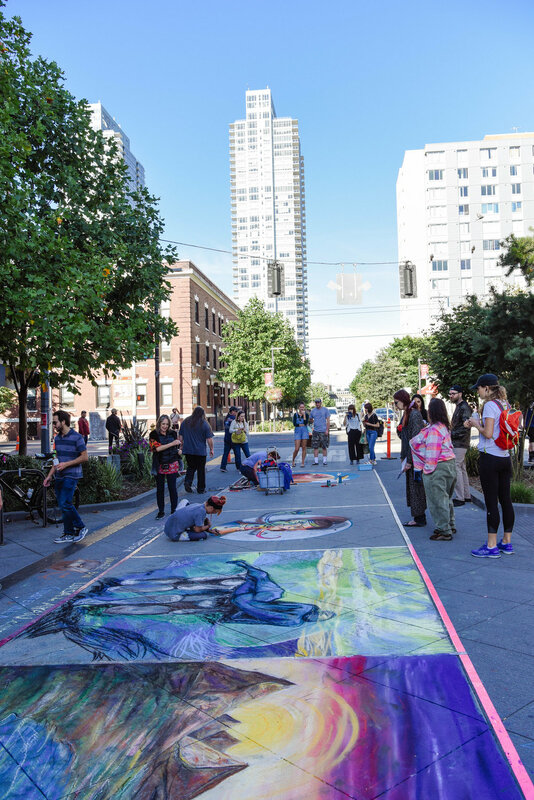 The Belltown Chalk Art Festival is an exhibition of artists creating chalk murals directly on the pavement of Bell Street in downtown Seattle. The event is free and open to the public from 10AM to 6PM, August 11-12, 2018. Join us for prizes, live music, a community drawing area, plus a chance to see professional artists creating amazing chalk art. IN Our second year, we are thrilled to partner with the grand opening of the MARKET TO MOHAI development project. "Market to MOHAI is a safe, engaging, well lit, and well-marked pedestrian corridor connecting some of Seattle’s great public spaces, from the Central Waterfront and Pike Place Market to Lake Union Park and MOHAI, connecting the Waterfront, Belltown, Denny Triangle and South Lake Union neighborhoods. This corridor serves residents and visitors alike, as they commute to work, shop and enjoy the opportunities for recreation in this vibrant, evolving, urban environment. In addition, it connects pedestrians with six of Seattle’s great Public Parks." THE BELLTOWN CHALK ART FESTIVAL IS LOOKING FOR ARTISTS, STUDENTS, Community groups and volunteers to create artwork during the event! No experience necessary, artists of all abilities are Welcome to our community drawing area. Space is limited and allocated on a first come, first serve basis. If you or someone you know is interested in participating, please send us an email by August 2nd. You can read more information about the community drawing area here.